The World Youth Championship(October 19-28, Batumi Georgia)is underway! 21 young talents are playing for the United States in twelve sections. 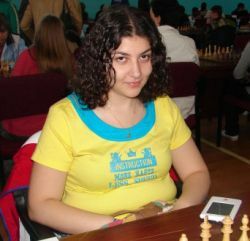 After four rounds of play top U.S. scorers are Tatev Abrahamyan, who is 4-0 in the Girls U18 and Ray Robson, with 3.5/4 in the Boys U12. In Soviet times, Georgia was known for having the best food of all Soviet republics. Although this doesn't appear to be kid-friendly fare, Darwin Yang and Eric Liao seem to be having a good time. Photo Dujiu Yang. SNo Name FED Rtg 1 2 3 4 Pts. Rk.